You can save, reuse, and export a segment from your email campaign. Segmentation is a tool in WordFly that allows you to create sophisticated subscriber lists in order to be more targeted in your email marketing. You can reuse segments in future campaigns as well. First create your segment and give it a name to save the customizations for a quick go-to the next time you would like to send to the same segment. Learn more about segmentation in our Introduction post. You can save a segment to use in another campaign anytime. When you are creating your segment, give the segment a name. This saves the segment for future use. Go to your In Progress email campaign, select the Subscribers tab. 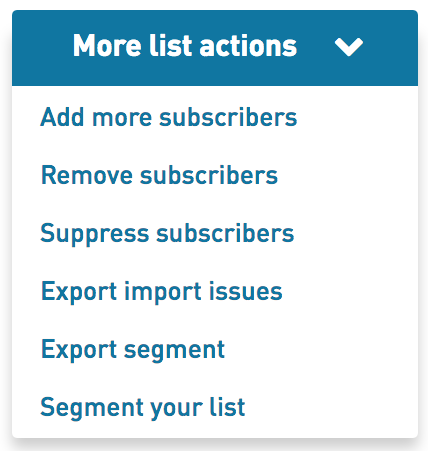 Select the More List Actions menu > Segment your list. Click Create a new segment. Once you have started creating the segment you can save it. click Save for reuse. Finish creating your segment by using either data fields or email events (opens, clicks, etc.) or any combination thereof. The next time you import a list, you’ll see this segment available to use! Once you’ve saved a segment you can apply it to any new In Progress email campaign in WordFly. You’ll see all your saved segments. Hover over a segment name and click Select from the right side. Click Apply to list to use it. Once you’ve applied a segment in your email campaign you can export it from the list summary page of that campaign. Go to your In Progress email campaign, select the Subscribers tab. Select the More List Actions menu > Export segment. The segment does not have to be a saved segment to export it. You can export both saved and unsaved segments. Download your file to review the results of the segment!